Born and raised in a town rich in history, C. Raymond is the seventeenth of twenty siblings. As a boy, he often times played in the woods all day while observing the ways and habits of animals. He became amazed at how nature worked together. This fueled his already vivid imagination as he grew. What he learned enables him to weave the most fantastic tales. He has been: an Athlete, Teacher, Poet, Inventor, Storyteller, Businessman, and now an Author. However, of these, storytelling is his favorite. Often times, C. Raymond can be seen in classrooms or on stage telling stories of folklore about history’s legends and the days of old. To date, his stories have been enjoyed by thousands of students, parents, and teachers alike. At their request, he has decided to bring his tall tales to life in print form and soon to come audio books. The FunGkins: The Battle For Halladon by C. Raymond Gray is a fantastical tale about FunGkins. This is a magical race of beings that for centuries were enslaved by the evil Leprechauns and forced to mine gold, and suffered many hardships, until they were able to escape. Many of them found their way to America by disguising themselves as rats on board the Mayflower. The story begins with Clara and her family in Pirate's Cove. After picking mushrooms in the forest, Clara's father found a really big one and the FunGkins send Jack One, and Jack Two to retrieve it. It is a special mushroom that contains powerful magic the FunGkins need to supply the magic necessary to maintain their realm. As a reward for helping them, Clara and Aunt Tilly get a tour of the Mushroom Valley. Everything seems wonderful until a tall, dark stranger overhears a tale of little people. When he appears on the Gooday's doorstep, they invite him in. Our heroine, Clara, calls her Aunt Tilly. When Clara spies on him with her magic telescope, she becomes terrified, and sends out a warning to the FunGkins. The author does an amazing job of describing everything in this tale so vividly that you, as the reader, can picture in your mind as if you are actually there. With all of the splendor, magic and wonder that could put Oz to shame, C. Raymond Gray's story telling reminded me instantly of the great J.R.R. Tolkien's The Hobbit. What I really liked was how when our villain appears the writing style became lyrical. By the story's end, you are left hanging in suspense for the next installment. The FunGkins is a wondrous, captivating book that can be enjoyed by all ages. All I can say is ... Wow! Thank you Stephen Fisher for five stars and thank you Reader's Favorite for choosing my first Children's Adventure Book as a 2016 Finalist! As an educator and parent I am always on the look out for raising authors and new reading material. C. Raymond Gray and his debut children's book The FunGkins is in my opinion a diamond in the rough. In this tall tale the author's ability to describe each and every detail paint's a picture in your mind as if your right were there. The powerful Zebrakhan, the evil long and tall Mr. Mustachio and his talking dog Snodsty, the scaly skinned Shangaar leprechauns and the inventiveness of all the things in Mushroom Valley. Not mention Clara and Aunt Tilly's adventure with the two Jacks and lessons learned. I will say this, my children and I read this book and came away quite simply thoroughly amazed. This is truly a fantastic read and in my opinion a classic in making. We can't wait for book two of the series. We all give this book five stars. It's a must read. This is a very visual read. What do I mean by this? The descriptions of the fairies, leprechauns and other characters, along with the settings are so well described you can see them in you mind. It is like reading and watching a movie at the same time. Because Clara has always believed in the little people she is the one that fate has decided must save them. The plot moves at a quick pace so it will keep those reluctant readers turning pages. I felt this was better suited for upper elementary to lower middle grades. Since for as long as I can remember I have loved fairy tales, Cinderella, Snow White, Alice and Wonderland and the Frog Prince just to name a few. I turned fourteen on September 7th and I got this new book The FunGkins as a gift. The first thing in noticed was the beautiful cover and how well it was done. That alone made me want to read the book. I thought what kind of unicorn is that in the background and what exactly is a FunGkin anyway. I had never seen characters like these or a unicorn quite like this one before. So I decided to give this book a try. I must say I’m glad I did, because I have never read a book with so many different things going on from one chapter to the next. I loved the house floating on air. I found the Cave of many Voices educational and it’s time travel exciting and different. The way the author describes the scenes throughout the book made the images appear in my head almost in living color. As I continued to read the FunGkins I found it refreshing not to read the same old tales told in a different manner. This book is so imaginative that for me it’s unlike any I have ever read. Clara’s dreams are truly out of this world: sword wielding leprechauns and two headed one eyed dragons. I especially loved the part where Jack One and Jack Two sleep walk, all the food made from mushrooms, fruits, nuts, berries, and vegetables. I also like the fact that there are FunGkins representing every race on earth. Then there is Clara and Aunt Tilly being chased by a giant cat. Not to mention all the amazing toys, games and rides the children play with there in Mushroom Valley. The floating train and the city under the sea just blew me away. This is without a doubt the best fantasy, action and adventure book I have ever read. Compared to all the other books I have read, I for one believe this book The FunGkins is destined to become a classic. After reading the Epilogue I can’t wait to read the next book in the series The Battle for Halladon. If you like adventure, then you will love this. There was not one moment where I was bored. 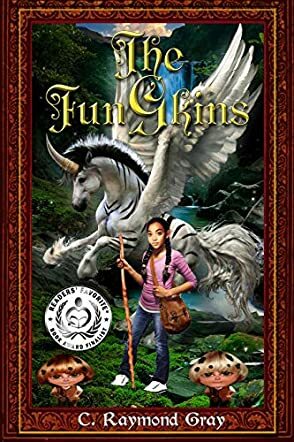 Each chapter was just as captivating as the next.The FunGkins has been overlooked and underestimated for so long, it is simply time for everyone to realize that this is the newest greatest thing that any children's publishing company has ever seen. If your child has not yet read this book, I encourage that they do!!!! !